Axilum Robotics was founded in 2011 in Strasbourg, France, by a team of leading experts in medical robotics. The objective of the company is to provide researchers and health care professionals with robotic solutions to improve both technical medical procedures and medical resources management. 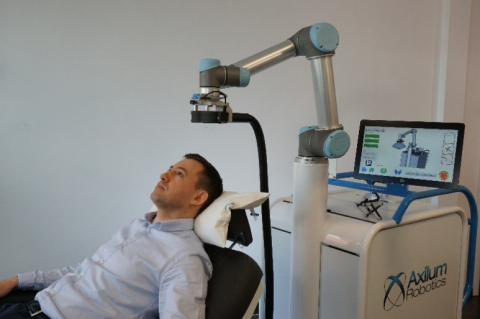 In 2013, the company launched the TMS-Robot OUS, the first CE marked medical robot specifically designed for Transcranial Magnetic Stimulation. TMS is a non-invasive neurostimulation technique. Its approved and potential applications are numerous, ranging from neuroscience research to the treatment of drug resistant neurological or psychiatric diseases. The procedure is usually implemented manually or with a fixed stand supporting the coil. Axilum Robotics has been ISO 13485 certified for its Quality Management System since 2013. Beyond its activities in Transcranial Magnetic Stimulation, Axilum Robotics is member of a consortium engaged in the development of a device intended for blood brain barrier opening using ultrasound (3BOPUS, supported by National Research Agency) and member of a consortium for the development of a device for the treatment of bone metastases using ultrasound (UFOGUIDE, supported by French Unique Interministerial Fund).